There is a TRS-80 in My Career Path! I was first introduced to “technology” when I was in high school. 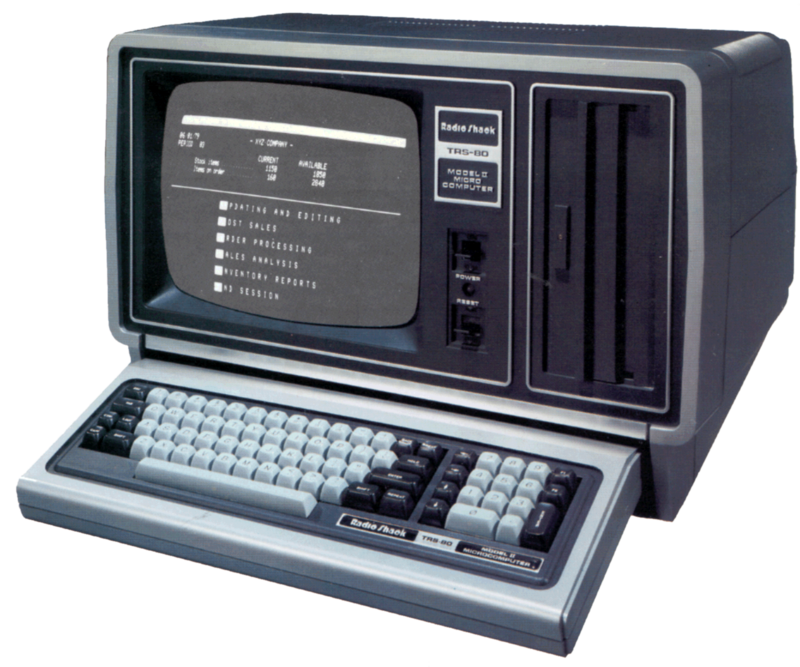 I grew up in a rural area of Alabama and was a senior in high school when, late in 1979, a Radio Shack salesman came by the school office and set up a Radio Shack TRS-80 Model II computer on the counter (I am dating myself now). I remember walking into the office and watching in awe as the salesman demonstrated the desktop PC – a computer that was marketed at the time as a state-of-the-art business machine. I stayed in the office through at least one entire class period watching, listening, and eventually tinkering with this computer. I was hooked! It fascinated me how some short commands could be typed into the computer and then by typing RUN, I could watch the command lines execute and see the results displayed on the screen. When I went to college, I studied math and the biological sciences. I chose not to pursue a degree in computer science because, at that time, while there were some computer science classes, there was not a computer science degree program at the small college where I attended. I also mistakenly thought that computer science degree was for programmers or for people who built computers – I wanted to use computers to solve problems. I took a few computer science classes and the professor saw my interest in technology and would spend extra time with me to discuss the advances being made in technology. One of the cool things he showed me was how to save my programs and data on a VHS tape! When I graduated from college and began my career, I started a small consulting practice so that I could work with small companies to computerize their businesses as well as help individuals identify the right computer for their home or business. At the time, it seemed technology was changing quickly, although compared to the rate of change today, it was nothing. The PC (personal computer) was now an affordable technology and most people wanted one. Technology, and how it could make work and life easier and more efficient, was something I was passionate about. I stayed in the office through at least one entire class period watching, listening, and eventually tinkering with this computer. I was hooked! That passion has steered my career down a winding path that I could have never predicted. I have been exposed to some great business/technology minds, but a most interesting discovery was that while these influencers in my life had great minds for business, they were also people of great personal character and demonstrated great minds outside the walls of their office. They had minds of servants, demonstrated not only in the office, but outside the office and in their personal lives. Each one really took an active role in the communities where they lived and worked. As I look back on all those who influenced my career path, I am reminded that I need to walk in the steps of those influences and encourage the young dreams and curiosities of the inquisitive high school student who just might be stumbling on something that ignites the fires of a never-before discovered passion in their life. I need to encourage the college student who has perhaps discovered their passion but has yet to realize the incredible breadth and depth of it. I need to support and patiently mentor the young professional who is struggling to drink from the fire hose of all that is coming at them in their young professional life. It is the least I can do for that nameless Radio Shack store manager and the TRS-80.